AJCU--Rev. Philip L. Boroughs, S.J. Rev. Philip L. Boroughs, S.J. is a faculty member and senior administrator with decades of experience and a deep understanding of Jesuit higher education through his work at Gonzaga, Seattle, and Georgetown universities. He assumed office as the 32nd president of Holy Cross in January 2012. Immediately before coming to Holy Cross, he served as Georgetown’s first-ever vice president for mission and ministry from 2003 to 2011. There, he was the only Jesuit serving as a senior university administrator. 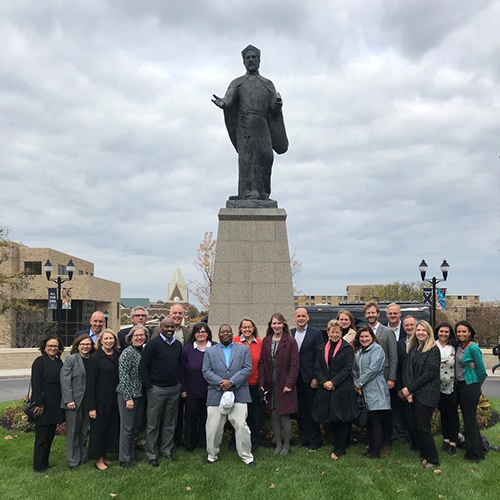 In addition to overseeing a division of the university which included the Office of Campus Ministry and the Office of Mission and Pastoral Care at Georgetown University Hospital, Fr. Boroughs was responsible for numerous programs for faculty, staff, students, and alumni which advanced Catholic and Jesuit identity. During his eight-year tenure at Georgetown, he raised funds to develop and endow the Calcagnini Contemplative Center currently under construction, to renovate the historic Dahlgren Chapel, and to endow positions and programs for the Office of Mission and Ministry. Born in Vancouver, British Columbia, in 1949, Fr. Boroughs was raised in Seattle, the third of five children of the late Robert and Catherine Boroughs. He earned his B.A. from Gonzaga University in Spokane, Wash., in 1973, and received a Master of Divinity from the Jesuit School of Theology (Chicago) in 1978. He holds a Licentiate of Sacred Theology from the Jesuit School of Theology in Berkeley (1987) and received a Ph.D. in Christian spirituality from the Graduate Theological Union (Berkeley, Calif.) in 1989. His doctoral dissertation was on John Woolman (1720-1772), the itinerant Quaker preacher in Colonial America, who advocated against slavery and whose journal is considered a spiritual classic. He entered the Jesuit order in 1967, was ordained a priest in 1978, and made his final vows as a Jesuit in 1986. Prior to coming to Georgetown, Fr. Boroughs served as the rector of the Jesuit Community at Seattle University where he was also a faculty member in the School of Theology and Ministry. Previously, he taught religious studies at Gonzaga University (1989-91), served as the assistant novice director for the Oregon Province of Jesuits (1980-82), and was a parish priest at St. Leo Church in Tacoma, Wash. (1978-80). A former member of the Board of Trustees at the University of San Francisco, he also served as a member of the Holy Cross Board of Trustees (2008-2011). Fr. Boroughs travels frequently for both professional responsibilities and personal interests. He has relatives in Canada, Scotland, and England; his four siblings live on the West Coast, and he enjoys hiking and outdoor recreation in the Pacific Northwest. He has traveled regularly to Kenya, leading a faculty/staff immersion experience, and in connection with his longstanding commitment to support and raise funds for St. Aloysius Gonzaga Secondary School in Nairobi. St. Aloysius serves young people from the slum of Kibera whose parents have died of AIDS. Rev. Philip L. Boroughs, S.J. has served as President of the College of the Holy Cross since January 2012.